By D Magazine | 2 years ago These trinkets engage everyone from little builders to grown-up coffee lovers. 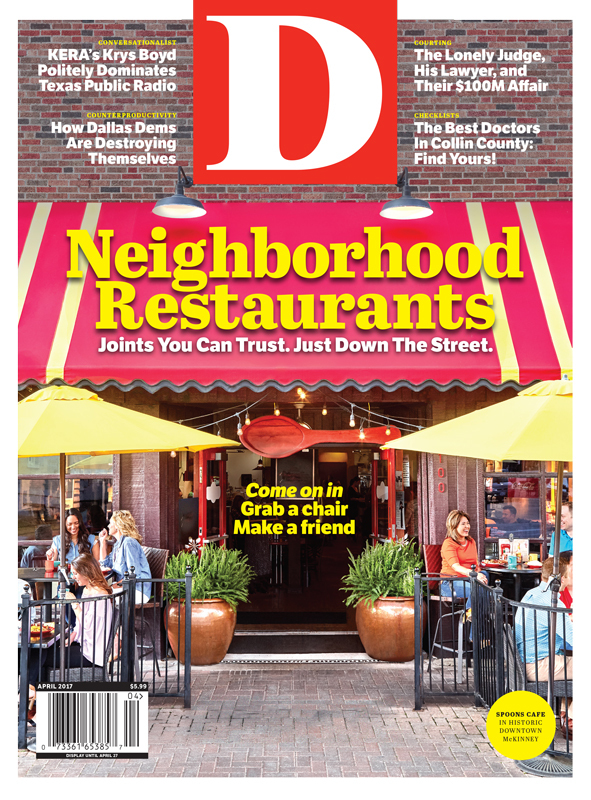 By D Magazine | 2 years ago The public relations professional on Dallas' best qualities. By S. Holland Murphy | 2 years ago These Indian fabrics are organic, handmade, and spun with pure gold—and you can get one for a steal. By Tim Rogers | 2 years ago An editor gives the Bag Boy Quad XL four stars. It could handle crashes better. By Zac Crain | 2 years ago Harry Hunsicker's seventh novel offers broad strokes of plot and fine details. By Peter Simek | 2 years ago Michael Cain believes film can change the world. And he's getting a chance to prove it with EARTHxFilm. By Eve Hill-Agnus | 2 years ago Under new executive chef Tom Parlo, the beloved restaurant is adjusting delightfully to new leadership in the kitchen. By Eve Hill-Agnus | 2 years ago While some standards fell flat, chef-driven plates show skill. By Alaena Hostetter | 2 years ago Meet the artist behind West Village's bright, geometric mural. By Barrett Brown | 2 years ago From the halls of ESD to roaming the chaotic streets of Tanzania with members of the Dallas Safari Club, a Desert Storm sniper, and his dynamite-throwing dad. By Peter Simek | 2 years ago Here's where to take advantage of April's packed cultural calendar. By Caitlin Clark | 2 years ago The city's retail landscape has recently welcomed an array of stores stocked with bro-approved brands. By Tara Nieuwesteeg | 2 years ago Finding this pub isn't easy. Its growing crowd of Uptown regulars likes it that way. By Jamie Thompson | 2 years ago The trial judge was sneaking around on his wife, skiing with one of the lawyers—platonically, he claims. Then he fell in love, left his wife, and everything got complicated. By Eric Celeste | 2 years ago The old guard is holding back young leaders. By S. Holland Murphy | 2 years ago Her cosmetics line, Reina Rebelde, celebrates the different sides of every woman. By Zac Crain | 2 years ago If you’re feeling overcome by rage, this Deep Ellum business is there for you. With a baseball bat. By Catherine Downes | 2 years ago Indulge in this dish while perched atop chic downtown boutique Forty Five Ten. By Kathy Wise | 2 years ago She grew up in an abusive cult, raised by murderers, and survived to tell about it in a new memoir.